He possibly should have done what we do at work and tie up his hair in the manner of Noldorian health and safety! Good thing he wasn't caught by NOSHA! I'd really like to imagine Legolas correctly, so I hope we can continue this discussion. Am I right that so far, we've agreed Legolas could have long hair, as long as he ties it back properly, not like it is in the movie? So I'm very interested in knowing what that context is. Are you just referring to the fact that he's an archer (short) and that most middle-earth elves are dark (color)? In fact, I thought I once heard a fan say that not only could he use his hair, but that the book actually said he did use his hair for his bow. The person went on to say that his hair would have to be really long then, since you wrap the string around the wood several times and stuff. But I'm no book-expert, I don't know where the passage is. So there's actually three levels for the discussion of wether he should have long hair: Real life, Tolkien's books, and the movies. I don't think this absurd; with Machine-gun Leggy firing arrows faster than in the movie "Hawk, the Slayer" (literally showing a ridiculous trick-photography Elf shooting about 5 arrows per second) then it's not a question of nit-picking. But Legolas doesn't do that in the book, does he? So maybe one might argue that he could have long hair in the book, but not the movie...? And one would 'guess' that Thranduil himself is dark-haired using the same general information and approach -- except that we have a specific description of golden hair with Thranduil. And that's an argument I heard for why Legolas would have blonde hair too: inheriting it directly from Thranduil. Yeah, like the ability to trap light inside gems. It would seem Arda-physics are a tad different from ours. My word. Long hair is the standard for an elf in most people's minds, isn't it? But where did it come from? I'd always thought it was a standard in Tolkien's universe too. however there was no mention of him having long hair (or golden hair) while all the other characers with long or golden hair were mentioned specifically. If someone had long hair it got mentioned. Umm, how do you know that? Isn't that kind of circular reasoning? "Tolkien never mentioned long hair on any of the elves he didn't mention." Therefore if it wasn't mentioned, then they didn't have it-- that's called a "logical contrapositive." That's not really true. Did he ever mention someone had short hair? How do you know which one is the "default"? Anyway, it would be worth checking out how exactly he mentioned the long hair, that would give us a clue. It if says "he had long hair", that's a sentence which is there specifically to mention the length, which would imply that others are likely to have short hair. But if it says "His long hair was black and beautiful / was flowing in the wind / whatever", then the main focus of the sentence is giving other information about the hair, and the "long" is just a sidenote, so it could just as well be that all elves have long hair. 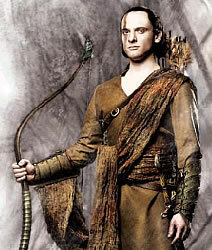 Oh yeah, and just out of curiousity: What do you think of this Legolas, does he fit better? Where does Tolkien actually first mention that blonde hair is rare? I'm no expert, could he have decided that after he wrote LOTR? Maybe he imagined Legolas blonde before making that "rule", or he forgot about it. Going back to the early 1950s for now, in Silmarillion writing we find JRRT noting that the Vanyar were golden-haired. And when Tolkien was writing Appendix F, in draft text he wrote that the _Noldor_ were dark-haired except for the golden house of Finrod ('Finrod' was ultimately changed to Finarfin). But that was a draft, and the ultimate, author-published version generally states that the _Eldar_ were dark-haired except for the golden-house of Finrod/Finarfin. Christopher Tolkien himself cannot explain why the Vanyar -- being Eldar -- seem to be ignored here, but it's possible that if the idea of the golden Vanyar had already arisen in Tolkien's mind, he might have forgotten at this point, or possibly it wasn't yet a solid enough fact in JRRT's head. Jumping to the later 1950s and beyond: Tolkien has established the golden-haired Vanyar (see Quendi And Eldar for example), and also writes that the Sindar resembled the Noldor in general, being dark-haired and so on (noting the exceptionally bright eyes of returning Noldor, as they had returned from Aman). We also find that the Vanyar were a relatively smaller clan, and we know that according to history they passed out of Middle-earth long ago to Aman. So, concerning the _Eldar of (remaining in) Middle-earth_ Appendix F is true enough. Despite later text, Tolkien did not revise the statement in Appendix F -- but noting that he did revise the name Finrod here, it's not like Tolkien skipped over this passage in the 1960s when he revised The Lord of the Rings for the second edition. Silver hair is noted among certain Elves, red or red-brown (coppery) too, among the sons of Feanor; but if we have thousands of Eldar, it would seem to me that such a statement should mean that dark hair was usual among the Eldar, with yellow or golden 'rare' enough. Well, regarding the issue of longer hair, I can only point to warrior cultures that were in favour of keeping at least part of their hair long. Those I can recall right now used to keep it together by some method - the Suebi warriors by tying a typical knot at the side of their head, the Japanese knights by having a knot on the back of their head, and the Sikh by using a turban of sorts. While the Germanic warriors preferred javelins, the latter two cultures would be frequently seen wielding powerful bows, and in the case of the Samurai, pretty large ones, too. You need to ask yourself where these images come from. Is the source really the story itself or is it some pre-installed picture inside your head, created from your own fantasies, from an artist's drawing, or from a wholly different story by a different author where "Elves" occur as well? Mind you, although an untold number of authors have borrowed ideas of Tolkien's in some way, usually their interpretation of Elves is warped. Either intentionally or, even more likely, unintentionally. I find the most faithful adaptation of Tolkien Elves is the "Eldar" of Warhammer 40k. Yes, those high tech jerks in space. Most other "Elven concepts" are of long-haired fairies who always wield bows (and sabres) and are typically either blonde, or female, or both. IIRC I read a passage where a character having long hair is mentioned. Personally, I like to imagine a good portion of the characters in LotR with short hair. Including Elrond (*prepares flame shield*). As for Legolas, I'm undecided. Regarding the picture, I think the face looks wrong. Not really Elf-like. Also, that shawl-like something draped around his upper body and arms looks terribly impractical. Or is it supposed to be a folded cloak? There's a rule called "inclusion-omission," which says that if something is mentioned specifically, then it's assumed to be absent in cases where it's omitted. So since long and golden hair were mentioned for others, then we should assume that Legolas didn't have either one since it was omitted for him. Also there's the question of battle. Even archery aside, long hair is easy to grab in a fight: and Legolas did a lot of knife-fighting, while orcs tended to grab people to hold them for other orcs, like they did Isildur's army. Overall long hair just seems like something that artists like to draw for the way it looks, but I think it just loses too much on contextual practicality for Legolas to be one of Charlie's Angels. Elrond was specifically said to have shoulder-length dark hair, as were Boromir, and Gandalf. There's a rule called "inclusion-omission," which says that if something is mentioned specifically, then it's assumed to be absent in cases where it's omitted. As I asked Witch-king, is long hair ever mentioned in any text in reference to Beleg Strongbow? Overall long hair just seems like something that artists like to draw for the way it looks, but I think it just loses too much on contextual practicality for Legolas to be one of Charlie's Angels. While it's true that Tolkien depicted very few Elves in his lifetime, both Beleg and Gwindor have long hair in JRRT's painting. Thus, with respect to this rule you raise, is there text (of any period, externally) describing one or both of these characters with long hair? And even if it's arguable that golden hair is rare among the Eldar of Middle-earth, and thus one might think it odd for JRRT to never mention that Legolas had rare golden hair (if he did), we can really only take that so far... in my opinion it's not absolute proof that he didn't have golden hair, only an opinion based on what 'isn't said' in light of 'things rare are arguably noted because rare'. And even with that, as far as I know we simply don't know what is rare or not as far as hair length among Elves. Strongbow was mentioned a scant six times in Silmarillion, which was likewise not Tolkien's narrative intended for publication; likewise Strongbow was never once described in any way. Legolas, meanwhile was obviously the most central Elf featured in all of Tokien's work, being the only Elf in the Fellowship from beginning to to end. Glorfindel was tall and straight... and his hood was thrown back; his golden hair flowed shimmering in the wind of his speed... his hair was of shining gold, his face fair and young and fearless and full of joy; his eyes were bright and keen, and his voice like music; on his brow sat wisdom, and in his hand was strength. The phrase "hair flowed shimmering in the wind of his speed" indicates that it wasn't long, since this would be described as "streaming behind him." The face of Elrond was ageless, neither old nor young, though in it was written the memory of many things both glad and sorrowful. His hair was dark as the shadows of twilight, and upon it was set a circlet of silver; his eyes were grey as a clear evening, and in them was a light like the light of stars. Venerable he seemed as a king crowned with many winters, and yet hale as a tried warrior in the fulness of his strength. This also denotes short hair, since it isn't long, and it's definitely black. Gandalf was shorter in stature than the other two; but his long white hair, his sweeping silver beard, and his broad shoulders, made him look like some wise king of ancient legend. In his aged face under great snowy brows his dark eyes were set like coals that could leap suddenly into fire. Here, we definitely see that Gandalf has long hair. There was also a strange Elf clad in green and brown, Legolas, a messenger from his father, Thranduil, the King of the Elves of Northern Mirkwood. And seated a little apart was a tall man with a fair and noble face, dark-haired and grey-eyed, proud and stern of glance. He was cloaked and booted as if for a journey on horseback; and indeed though his garments were rich, and his cloak was lined with fur, they were stained with long travel. He had a collar of silver in which a single white stone was set; his locks were shorn about his shoulders. So Legolas gets no description other than his clothes, and is given rather short-shrift, while Boromir is rather detailed, and he also has shoulder-length hair. soon Haldir turned aside into the trees and halted on the bank of the river under their shadows. The Men that rode them matched them well: tall and long-limbed; their hair, flaxen-pale, flowed under their light helms, and streamed in long braids behind them; The sunset gilded their spears and helmets, and glinted in their pale flowing hair. But of all this, not one mention was made of Legolas having long or descript hair, so it would therefore be like most Elves, i.e. short and dark. This would be described as..?? Why? Why would you assume that? Certainly he could describe it that way, but there's any number of ways to describe such an occurance. It's what a thesaurus is helpful for. There's more than one way to describe long hair, and being a fine writer Tolkien would certainly use more than just the one phrase streaming behind him. In fact, hair flowed in the wind of his speed implies Glorfindel had long hair to me. My hair is short and it certainly doesn't flow in the wind, at best I get a little ripple. The same with Elrond, you might be right, heck it's a 50-50 shot, but there's nothing in that passage that denotes anything regarding hair length. Your inclusion by omission theory has some merit but it's far from a smoking gun, at best you've changed the odds to 70-30 in favor of short hair. It's a good chance but I wouldn't go all in based on that alone. You're establishing a set of rules on how to describe physical characteristics half a century after the fact and somehow expecting Tolkien to adhere to them. Not sure it works that way. Your rules have a function as a guideline but forming definitive opinions, esp unwavering ones like yours, based on assumptions is generally a bad practice. I posted 'is there text (of any period, externally)' which means use any text that Tolkien wrote, from The Book of Lost Tales and the Lays to the early 1970s. Beleg is described in the Lay of The Children of Hurin and in the long prose version of The Children of Hurin (the Narn). Galin wrote: "And even with that, as far as I know we simply don't know what is rare or not as far as hair length among Elves." You may follow this with your own argument, but I don't see how this statement of mine points to your inclusion omission. It indicates that his hair flowed shimmering. As already pointed out, we can't know that Glorfindel's hair would certainly be described the specific way you put it, if it was long. Incidentally, and not that it proves anything, but I'm with Madomir here, as this does give me the impression, at least, of long hair, which would fit nicely with (again, simply to note it) Tolkien's early Fall of Gondolin, where the Balrog fell but took Glorfindel down with him by grabbing his hair (though I realize Tolkien was not necessarily bound to repeat this detail in any updated version of course). It denotes nothing about length as it isn't described either way. (...) But of all this, not one mention was made of Legolas having long or descript hair, so it would therefore be like most Elves, i.e. short and dark. But we don't know that most Elves have short hair in the first place, and none of the quotes you posted prove this claim. And for myself, I don't see any need to accept this rule you propose as part of Tolkien's craft. Obviously you're free to imagine Legolas as short-haired, but in any case Beleg Strongbow (who appears in the Narn often enough) has long hair in Tolkien's own depiction. My hair is short and it certainly doesn't flow in the wind, at best I get a little ripple. As for the argument, I think one has to contextualize books, though of course care should be taken in this respect as well. The society that Tolkien lived in or most likely had in mind had short hair as a standard for men. IIRC, long hair was a sign of affluence commonly displayed by upper classes, but tied back when going to war. The norms of a society influence the way an author describes things; thus some ancient sources go into detail about certain things but completely ignore others, as they are "self-explanatory" - or were, back then. IMO short hair is more practical and with most men, it just looks better (ask some women if you don't believe me). I want my male Elves to look masculine and my female Elves to look feminine. Though perhaps I'm much more extreme in this respect than Tolkien himself. The proposed DEL- 'thick, dense' will not, however do: it does not provide suitable Quenya or Sindarin forms outside the proposed *spin-dele "mass of hairs, head of hair." And actually, DEL- doesn't seem to really contain the meaning 'long' so much as 'think, dense', despite 'mass of long hair' above. Hmm, if so then why write long at all? maybe Tolkien was thinking of Glorfindel specifically, pulled to his death by his (short?) hair... just a guess! Wow. Glorfindel and the balrog, both falling in a deadly catfight. That would be sad... doubly. It's been used twice elsewhere in reference to long hair on the move, and no there's use bandying thesauri simply to variegate. What does "shimmering" mean to you? So Glorfindel's hair was long enough to be "flowing," but not "streaming;" particularly when Gandalf's and Boromir's hair-length was expressly mentioned, as was Celeborn's. That's a pompadour in my book. Care to back up that ratio, other than hedging? You're establishing a set of rules on how to describe physical characteristics half a century after the fact and somehow expecting Tolkien to adhere to them. Establishing? Ha, I'm not quite that old. Actually these are the standard rules of English writing and grammatical interpretation, for those who've attended post-graduate studies in them, like Prof. Tolkien and myself-- unlike pulling exact ratios out of absolutely nowhere. I'm simply expecting that Tolkien did follow these standard rules of English narrative, with his not exactly being an uneducated illiterate or sophomoric dunce in them; this is J.R.R. Tolkien we're talking about here, not J.K. Rowling with her visceral descriptive-metaphors. Not sure it works that way. Your rules have a function as a guideline but forming definitive opinions, esp unwavering ones like yours, based on assumptions is generally a bad practice. "My" rules? There you go again, thinking that anything foreign to you, is an invention of the messenger, ala arguing from vapidity; however the standard rules of English writing were around long before my time, and they're accepted perforce over your magical deductions of proportionate probability. So Glorfindel's hair was long enough to be "flowing," but not "streaming;"
To the open mind it's quite clear it can be both. In the real world do not streams flow? So because he used streaming twice it's your contention that Tolkien is restricted to using only that term when describing long hair in motion? Is this your mandate or that of your post-grad English prof.? unlike pulling exact ratios out of absolutely nowhere. This has always been one of the more frustrating aspects of arguing with you. You take things far too literally almost always. You're like a train, you can only deal with what's directly in front of you but any lateral motion creates an ungodly mess. He said long hair streams therefore nothing else can indicate that hair is long except the word stream! How obtuse can you be? Part of the art of writing is finding different ways to say the same thing. On one hand you tell me how educated Tolkien is, but on the other you don't give him enough credit to use a simple synonym. “Open mind” like JFK, i.e. losing your head to your own vanity, like when he insisted on taking the top off of his car in order to be more visible to the public-- and so Oswald followed suit with his head and brain. Words mean things, and here the silence on long hair speaks volumes in the context of it shimmering. You have to include all the words and rules--including the inclusion-omission rule-- not just apply them selectively to back up your foregone image; the only image that matters is the author's, not yours, though many seem to forget that. Yes, but flows do not stream— i.e. now you’re ignoring word-forms to confuse nouns with verbs, while confusing metaphors to compare hair with water. If you have to do that, just surrender or fall on your sword, it’s more dignified. Those are your words; I simply said that shimmering is not streaming, but denotes shorter hair not long, as it implies some resilience against the wind that long hair couldn't have. Then you throw in “flowing” while throwing out context of "shimmering," and it’s clear that you’re just picking words like cherries, i.e. taking the good ones that support your claim, and ignoring the rest. Doesn’t work that way: reading is tabula rasa, but here you’re reading through the filter of your own foregone image, which is based on prior mis-readings—and other people’s, via art and possibly discussions. There’s no fool like a bunch of ‘em. So you say I derailed your entire argument with a single challenge; good, admitting it is the first step to recovery. I know you hate to be called on your statements, but that’s how consistency works. However you're obviously saying that your own mental image changed from 50-50 (i.e. outright ignorance) to 70-30 (i.e. slanted toward shorter)-- which just makes you 70% literate instead of 50. That's not as bad, but it's still on a school-bus if not the short one. You're also confusing your mental image with the objective description, meaning you're perfectly literate-- clearly we're proving otherwise. He said long hair streams therefore nothing else can indicate that hair is long except the word stream! How obtuse can you be? About as obtuse as you are being, when you claim that I said that, when I didn’t; since that’s about as obtuse as one can get. I said there aren’t many other words suitable for streaming hair, and you have yet to present that Tolkien used any. But hey, why settle for putting your words in Tolkien's mouth, when you can put them in mine as well? That's called "egocentric narcissism," i.e. thinking you're right and attacking all who dare to differ. Shimmering is not streaming; and no synonymous expression for streaming was any used. Nor was his hair flowing behind him, despite denoting his speed-- again context cannot be ignored, so here we have hair that was flowing, but shimmering, not trailing or lagging him in any way. Part of the art of writing is finding different ways to say the same thing. Again, that’s bad writing. And since we’re reading, then you are simply mis-reading it accordingly, forming an image, and now fighting like mad to defend it. On one hand you tell me how educated Tolkien is, but on the other you don't give him enough credit to use a simple synonym. Sure I do, I simply don't give you credit for reading it properly- again, we see you're forgetting your place and implying that you are Tolkien, since you imply that a synonym was used when you've presented no valid argument of such. You simply presented a synonym out of context, to mean whatever you want it to mean; and so here we come full-circle, thus illustrating the one in which you’re going… along with your logic, with your evidence simply stating your conclusion. Now do you want to flunk English forever? It's better to admit a fault and be a fool for five minutes, than deny it and remain one for life. What is it Gandalf said to Wormtongue about bandying crooked words?? Those are your words; I simply said that shimmering is not streaming, but denotes shorter hair not long, as it implies some resilience against the wind that long hair couldn't have. The word shimmering was never the issue here. That, along with the rest of your latest post, is naught but a lame diversionary tactic on your part. Shimmering is a visual; most likely the sunlight (or moonlight) was reflecting on his long flowing hair much in the same way it might on the surface of a lake. As you stated clearly in your quotes above, the issue here is, and has always been, the supposed difference between flowing and streaming. Which as Merriam Webster has shown, for literary purposes doesn't really exist. They are synonomous. No correalation can be drawn to hair length by the choice of one word over the other. However you're obviously saying that your own mental image changed from 50-50 (i.e. outright ignorance) to 70-30 (i.e. slanted toward shorter)-- which just makes you 70% literate instead of 50. That's not as bad, but it's still on a school-bus if not the short one. If you were literate enough to comprehend what you read, you'd know that the 50-50 thing was in regards to Elrond and has nothing to do with this issue of Glorfindel, even when taken out of context as unscrupulous folks like yourself are prone to do. By the way TWH, this is your post as I quoted it, emphasis mine. Yes you later edited your earlier post -- but just for clarity now, according to your argument anyway: Elrond is an example of a short-haired character because his hair length is not described (within the context of inclusion-omission and so on), and is not an example of a 'long-haired' character that can be counted on the 'inclusion side' of your argument. But just for clarity now, according to your argument anyway: Elrond is an example of a short-haired character because his hair length is not described (within the context of inclusion-omission and so on), and is not an example of a 'long-haired' character that can be counted on the 'inclusion side' of your argument. Yes, I should have said IIRC. No biggie. Beleg and Gwindor: not noted anywhere in text (that I recall), but illustrated as long haired by JRRT (1928). Celegorm (noted in Quenta Silmarillion, mid to late 1930s version, IIRC). Olwe (Quenta Silmarillion early 1950s). Celeborn (draft text [long white hair]. Published text [long silver hair] 1954, The Lord of the Rings). Fingon (noted 1968 or later, The Shibboleth of Feanor). That's not necessarily all. Any more? Celegorm also had golden hair in this text! Celeborn: silver, Olwe: white, Fingon, Beleg and Gwindor: dark hair. Also, is there anything on the web where I could read more about this inclusion omission as it relates to writing? I did a quick search but only found the following so far. Again: hair isn't always described; but when it is described in a situation, then inclusion-omission applies. Here we have the descriptions of the hair of Elrond, Glorfindel, Gandalf and Boromir; meanwhile Aragorn's hair had been described already in Bree. In this case, Legolas's description is nondescript other than by his clothes and his being an Elf, while no mention of his hair was made eiter then or after; meanwhile Boromir's hair-length is described in turn, a clear instance of omission-inclusion. Again, color is specifically mentioned, while Legolas's isn't. Now I grant you this: it's entirely possible that Tolkien simply gave Legolas short-shrift in order to keep the focus on the other characters in the story-- something Mr. "I always play an elf-character" Jackson got backwards; however to describe things like the shape of his hand, while omitting such an obvious thing as the length and color his hair, if they were unusual, is simply too much a stretch. Legolas was simply described as "a strange Elf clad in green and brown," and so there woudn't be much to notice other than that. Again: hair isn't always described; but when it is described in a situation, then inclusion-omission applies. Anyway I asked if you could provide a link to more about this inclusion-omission rule in a literary context. '… then pointed out and named those who Frodo had not met before. There was a younger dwarf at Gloin's side: his son Gimli. Beside Glorfindel there were several other counsellors of Elrond's household, of whom Erestor was the chief; and with him was Galdor, and Elf from the Grey Havens who had come on an errand from Cirdan the Shipwright. There was also a strange Elf clad in green and brown, Legolas, a messenger from his father, Thranduil, the King of the Elves of Northern Mirkwood. And seated a little apart was a tall man with a fair and noble face, dark-haired and grey-eyed, proud and stern of glance. He was cloaked and booted as if for a journey on horseback; and indeed though his garments were rich, and his cloak lined with fur, they were stained with long travel. He had a collar of silver in which a single white stone was set; his locks were shorn about his shoulders. On a baldric he wore a great horn tipped with silver that now was laid upon his knees. He gazed at Frodo and Bilbo with sudden wonder. Keeping in mind your 'There's a rule called "inclusion-omission," which says that if something is mentioned specifically, then it's assumed to be absent in cases where it's omitted', I note that Boromir is specifically mentioned as tall, fair and noble of face, dark-haired and grey-eyed. Legolas is never mentioned here or anywhere as dark-haired -- this detail is just as much of an omission as long or short hair concerning him. Why isn't Legolas short haired and light-haired according to this rule? Because (it seems) one can find another instance where someone else is noted as golden-haired, using any book, and claim that though dark-hair is included here... it yet should not be 'assumed to be absent' and so on -- basically we should ignore the inclusion of Boromir's dark hair in this passage, because we can raise someone else that is noted as having golden-hair, and compare that to the lack of description for Legolas too. As I say, I would like to read more about this rule. Also consider Thranduil's hair in The Hobbit: The feast that they now saw was greater and more magnificent than before; and at the head of a long line of feasters sat a woodland king with a crown of leaves upon his golden hair, very much as Bombur had described the figure in his dream. It appears, according to this, that one can take an example from one book -- a book in which one of the characters noted in a given comparison never appears (The Hobbit and Legolas) -- and compare it to the omitted description of a character from a different book or story. Thus can't we similarly note Celeborn's specifically mentioned long-hair in The Lord of the Rings, and compare it to Beleg's omitted (hair length or colour) description in a different source, the Narn? Or the Lay of the Children of Hurin? Again, according to this rule, would you not have people agree that Beleg is short-haired, like Legolas? But we see that JRRT depicted Beleg long-haired in an illustration (a bowman to boot). (...) Legolas was simply described as "a strange Elf clad in green and brown," and so there woudn't be much to notice other than that. If Legolas' hair isn't shorn about his shoulders I see no reason why it can't be longer -- not shorn about his shoulders but well past his shoulders -- maybe like the hair of Erestor or Galdor and perhaps not notably different in length from other Elves in the room. his locks were shorn about his shoulders. What does this even qualify as, long or short? When long hair is said to be streaming and/or flowing in the wind, wouldn't shorn at the shoulders be considered short? Or is it moderate, neither long nor short. And if that "shorn about the shoulders" length is itself debatable, how can it be steadfastly and positively determined what length hair is being either omitted or included? I go back to what was said before, inclusion by omission is useful as a guideline but to consider it a binding law where there is so much room for interpretation is misguided. Bottom line is we don't know if Tolkien was thinking along those lines or not. Was he aware of this literary tool? Of course, but he certainly was under no obligation to utilize it throughout all his writings. Yes, I'm quite sure that Tolkien was aware of standard Engish, rather than simply spouting details randomly. I said earlier that he'd have short brown hair; but here "dark" seems to mean much "black" for our purposs. Most Elves would seem to have medium-brown hair of this brown color, unless noted otherwise; but Elrond, Aragorn, Boromir and Arwen would have darker hair than most Elves because of their common ancestry to Luthien and Numenor. Meanwhile Legolas, it would seem, looked like most other Elves except for his clothes; certainly he's not described otherwise.